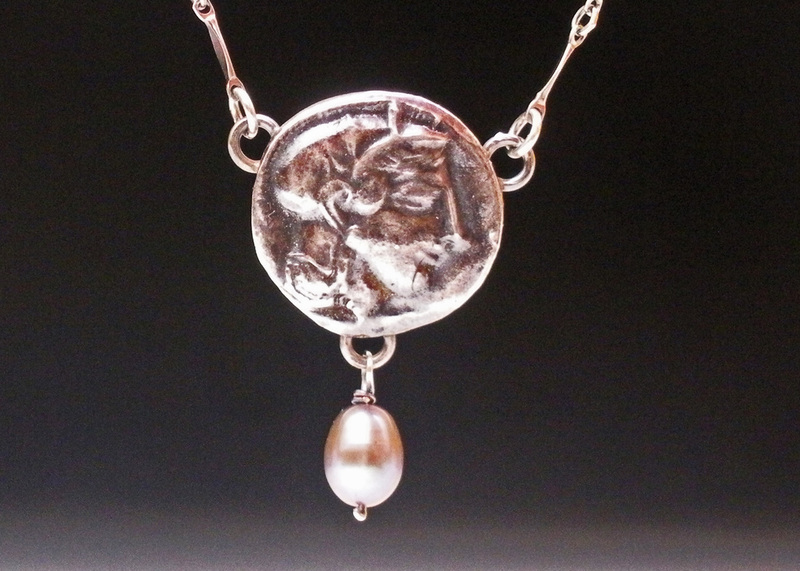 Created from imprints of antique cameos from the Art Nouveau era, depicting goddesses from Greek and Roman mythology. Roman goddess of the hunt, protector of women and children, Diana is also known as Artemis in Greek mythology. Depicted with her bow and arrow, and her dog at her feet. Known as '"the land between two rivers," Mesopotamia existed between the Tigris and Euphrates rivers and is called the "cradle of civilization." This bird image is taken from a museum replica of an ancient wall relief, depicted in sterling silver, with champagne freshwater pearl. 16" or 18"